Federal Express Entry System is undisputedly the most popular online point-based immigration system in the world. It’s the most organized economic immigration program that has clear and precise instructions and policies. It’s amazing how it invites just under one lac applicants every year to apply for permanent residency in Canada, through a smooth procedure, with no hassles or glitch. Although, the Immigration Refugees and Citizenship Canada didn’t make any big reduction in the qualifying marks or CRS score requirement, however, the number of invites the EE system able to send this year is outstanding. This shows rising popularity of Express entry system as more and more people are applying for this program world over. 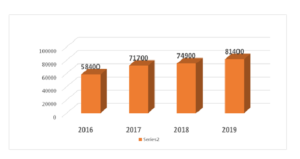 If you look at the number of people getting invited for Canadian permanent residency through express entry year on year, the number is staggering. The record till now for Federal Skilled Worker Category of Express Entry invitations has been phenomenal take a look. If you look at the year on year rise in the annual immigration target for inviting foreign skilled worker, it’s outstanding. The key reason behind this is skill shortage in different provinces and territories of Canada, for which, it needs the skilled migrants in good numbers. In the month of October 2018, record 11,700 Canadian PR invitation issued to the applicants, which is the highest number issued in any calendar month till date. There have been 3 draws in the month before, however, no month witnessed such a huge number of invitations issued by IRCC. Take a look. The most surprising factor in this whole year was that IRCC was able to issue huge number of Canadian PR invitation without even making any considerable reduction in the CRS score requirement of qualifying marks. Thanks to various relaxation provided by the IRCC (Immigration Refugees and Citizenship Canada) in the last couple of years, which have made an increased number of people eligible for Canadian PR. It’s a great time to apply for permanent residency in Canada with Canada aiming to invite the huge number of applicants through express entry and other provincial nominee programs of Canada. 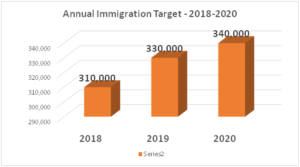 As per the multiyear immigration plan (2018-2020) of Canada, it is likely to invite nearly one million immigrants in next three years. Hence, it’s the high time to apply for permanent residency in Canada, when the government is accepting the skilled and talented people with open arms. All you need to do is coordinate with a trusted and accredited Canadian immigration Consultancy firm to prepare your immigration file for most appropriate visa program. You may call Visas Avenue migration experts on Toll-Free Number- 78-18-000-777. Moreover, to get your eligibility checked and subsequently, get a call from the expert, you may fill the free assessment form.